Samsung launches Galaxy Golden flip phone in India for ₹51,900 (INR) / $844 (USD) / €613 (EUR) with two 3.7-inch screens. "With its innovative dual display and premium golden finish, Galaxy Golden brings together the best of touch and type experience on a smartphone. This specially crafted device is aimed at consumers seeking seamless integration of stunning classic design and functionality to make their lives more efficient." said Vineet Taneja, country head, Samsung Mobiles & IT in a statement. 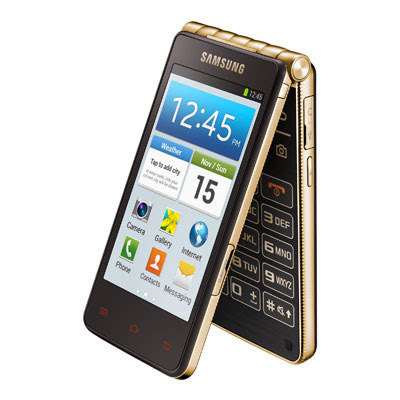 The new Samsung Galaxy Golden phone features two 3.7" sAMOLED screens, operates on the Android 4.2 (Jelly Bean), equipped with 1.7GHz dual-core processor, 1.5GB RAM and 1820mAh battery. The Galaxy Golden phone packs 8MP rear, 1.9MP front camera and comes with 16GB internal memory.